Mister Miracle: The Power of Kirby! – AiPT! The King saw the future, and hoped that we could, too. Can a father hurt his son? That is the central question of the “Fourth World” saga, the piece de resistance of Jack Kirby’s long and storied career. It’s a question hinting at the primary dynamic of our shared existence: the old always gives way to the new. The saga’s New Gods, as they’re dubbed, are what happens when that which brimmed with life turns to ash, just in time for something new to rise up in its place. Utilizing the Bible and other mythologies as a springboard, Kirby forged a fresh mythology for our contemporary age. The old worlds, the generations of the past, giving way to something different, something with a ceaseless eye on the future. No longer do we have gods of the Vikings and ancient Greeks, but gods of our present and future. These are gods of technology and science, with advanced hand-held computers, and a chief antagonist in pursuit of an equation to master all things. It was modern myth-making in the purest, clearest sense. It was bombastic and powerful, full of the energetic “Kirby Krackle.” At its core, the story beat with the usual Kirby heart. This was a story of fathers and sons. Highfather and Darkseid, The God and The Devil, exchange their respective sons, Scott Free and Orion, to form a pact that maintains cosmic peace. And so God sells his son away to The Devil, whilst The Devil barters his son off to God. Highfather, in the name of the greater good, damns his son to literal Hell, while Darkseid elevates his own son to literal heaven. It’s a powerful story, taking the familiar and recasting it into the bright, unexpected form in the classic Kirby tradition. Built on thunderous contradiction and complexity, it’s a tale brimming with questions, all told through the lens of familiar mythic archetypes and high concept ideas. Kirby always imagined a better world, and part of that was family. It was his loved ones that pushed Kirby forward. Even when moving over the DC, having the pick of anything and everything, he chose to take on Jimmy Olsen, their smallest and lowest selling book, simply because he didn’t want to take work away from any others supporting their own families. That was Kirby. That sentimental spark was the beginning of the “Fourth World” myth. And thus we have The New Gods. A world built on dichotomies, a place of pure binary. Good and evil. New Genesis and Apokolips. Highfather and Darkseid. But beyond those frameworks, Kirby’s choice in protagonists is what makes the sprawling saga so endlessly compelling. In The New Gods, you have Orion, the son of The Devil, raised in Heaven by God. In Mister Miracle, you have Scott Free, the son of God, raised in Hell by The Devil. The former was the flagship and saw Orion, the central protagonist, grappled with his father, once more bringing Kirby’s burning question to the forefront. Orion represented all of us, eternally struggling with his own inner dark side, which he could never be rid of, no matter what he did. The title “Darkseid” (actually reading “Dark Side”) is a purposeful one, as the Dark God is a literal manifestation of our own inner dark sides, growing ever stronger with our every single mistake. Orion’s horrific visage resembling his father is a literalization of the horror that there exists a shadow self we can never truly cut off. The former saw Scott, Kirby’s own Jesus Christ, abandoned both Apokolips and New Genesis to choose Earth. Abandoning the binary options on the table, he chooses freedom and love with Big Barda to serve as the escape artist and entertainer of our world. He chooses our existence over the one he was born into and saddled with. 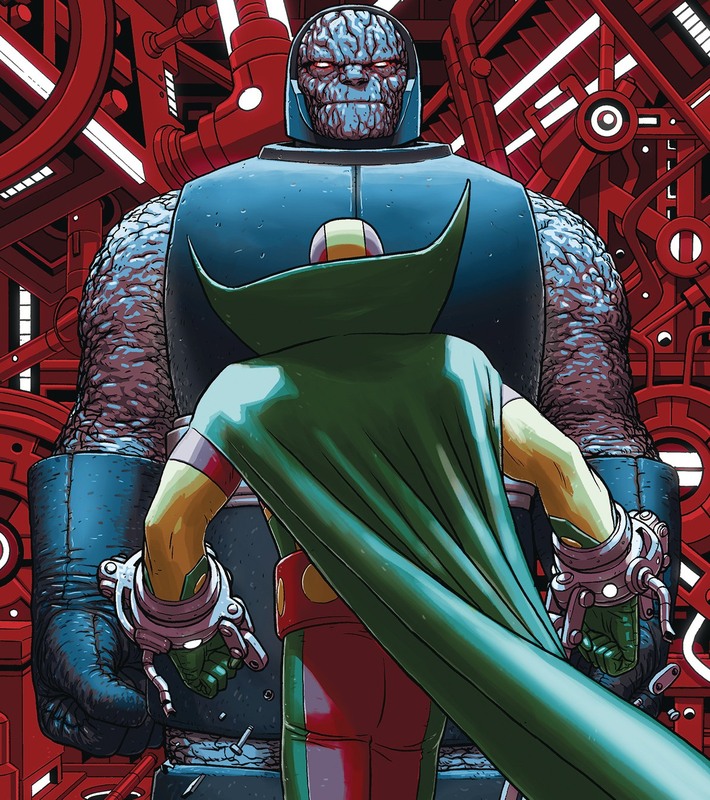 Which all leads us to the current Mister Miracle series, a book that has put the spotlight back on Kirby’s magnum opus and his most personal work. Forged by the terrific talents of writer Tom King, artist Mitch Gerads, and letterer Clayton Cowles, it’s a fascinating dive into “The Fourth World” mythology. Striving to internalize and provide a more intimate portrait rather than out-Kirby The King himself, it’s a book that’s very much set as a domestic drama. It’s an approach that seems Anti-Kirby at first glance, but couldn’t be more Kirby-esque. Scott Free, after a suicide attempt, wakes up in a world that he cannot comprehend, where nothing is right and reality has distorted, and his only solace is his loving wife, Barda. Opening with a shot of his hands bleeding out in an almost Christ-like pose, the book immediately pushes its primary motive and understanding of the core material. Kirby’s Christ is here, with us, and it’s a powerful visual summary of the book’s ethos. Throughout the book, we see Scott Free navigate cosmic wars as a New God whilst experiencing deep anxiety and depression. The book uses its blend of cosmic scope and domestic drama to weave the two together, effectively conveying that the struggles a couple faces in daily life are no less trivial or important than a battle for existence. Scott and Barda’s struggles are our own, but told through Kirby’s cosmic context. From white “Kirby Krackle” to the classic designs, there’s a lot of Kirby in the book visually, despite the drastically different approach rooted in the 9-panel grid formalism to express the nature of Scott’s world and his accompanying emotions. Going beyond even that, the book is absolutely as Kirby as one could image or hope for, as it once more expertly wrestles with that burning question at the heart of the entire franchise. Can a father hurt his son? Scott’s father, the divine Highfather, certainly did, regardless of his intent. And Darkseid, Scott’s other father, did as well. That trauma, that deep burden and pain, is at the very center of the entire book. It’s what led Scott to his suicide in the opening pages and it’s something that continually haunts him throughout. Extrapolating these existing dynamics, the team behind Mister Miracle decides to go even further. In a saga built around fathers and sons, past and the future, they add a new wrinkle that makes perfect sense. Scott Free has a son. It’s a fantastic expansion of the core ideas and themes upon which the characters work and it makes even more sense within its own narrative. The struggles of pregnancy, raising a child all become the heart of the domestic struggles and help heighten the tale further, granting it even more weight and placing it on par with, if not higher than, the cosmic battles of existence. And the name of the child? Jacob. The true name of Kirby himself. It’s no coincidence, as the book plays with a lot of fun meta-textual ideas and elements throughout its run. Scott and Barda have long been said to have been modeled after Kirby and his wife, Roz Kirby. There’s also a scene in issue #5, where in Scott Free confront’s Jack Kirby’s hand-prints, with a signature and his iconic line “Kid, comics will break your heart.” Scott Free places his hands on the prints of his creator, his meta-textual father, and he doesn’t quite measure up. The book consistently brings up Kirby to play into the fundamental conceit of fathers and sons and the larger meta-textual nature, which plays into the creator and creation, and yet another layer which expands the book’s sense of texture. The book’s most raw and heady exploration comes in the end when things hit an all time low. The forces of New Genesis are losing and Darkseid has The Anti-Life Equation and thus the upper hand. Mister Miracle and Big Barda’s chances at winning their cosmic war have dwindled. Attempting to negotiate another treaty, Darkseid makes them another pact. Scott Free, the new Highfather, must hand over his son Jacob to Darkseid, the same way Scott was as a child, and in return Darkseid will surrender. The Anti-Life Equation may be stripped away, the war may end, and all of existence and life may be saved. It’s a devastating blow to Scott Free and an utterly Darkseid-ian maneuver. All his life, Scott’s judged his father for giving him away, for making him suffer, burying his anger and self-loathing, wondering how a father could ever do that to his son. Here he is now, confronted with that same horrific choice. Sacrifice your beloved son and save all others or face a war that will wipe out everyone. The conflict plays into the cyclical nature of things, wherein the son becomes the father. It cuts to the very core of all that New Gods is and has been and ultimately will be. And it works the way it does because we’ve been on this journey with Scott and Barda, seeing them have their son, witnessing their incredible love for him. Tortured endlessly about the choice as Scott wonders what he can even do. There’s only two choices, these irksome binaries. But the answer that he needs ends up arriving in the way he least expects: through Kirby. Funky Flashman, Kirby’s Stan Lee stand-in, acts as Jacob’s babysitter in the book. During Scott’s troubles, as he contemplates the meaning of life, Funky tells him of a story they both came up with together, the tale of The Stareater and The Golden Retriever. It’s a fairly obvious take on the classic Galactus story by Kirby and Lee, with even a Marvel alliteration for the character’s name. While Scott is initially confused by this silly and simple comic book story, he derives a deeper understanding. The story is one wherein there’s only two reasonable choices, but The Golden Retriever makes an absurd, third choice by seeking out Batman, who can accomplish the impossible. And thus Scott understands that he must look beyond the binaries. For is that not who he is? The man who looked beyond both Hell and Heaven and chose the absurd Earth as his home. And thus, saved by the imagination and story of The King, Scott forges onward to make a choice beyond the two binaries laid out for him. He does the absurd, the utterly impossible, and faces Darkseid having stripped him of the Equation and Jacob. He’s beaten, he’s bloody, he cannot go on and yet he manages to stand. That’s what makes the book so utterly Kirby. It’s the hero managing the impossible through the power of pure imagination. It’s the hero standing tall, not just for himself, but for family, for love, and ultimately, for his son. It’s standing for the sake of the future, for the next generation, for those whose time hasn’t yet arrived. It’s fighting for the youth, against the dark side that eternally haunts us, that thing trying to get us to gamble away said future for momentary solace. It’s looking that dark side in the eye and beating it, having imagined a greater path forward. It’s the absolute spirit of Kirby made manifest, brimming with all his power and defiance, strength in the face of insurmountable odds. In an age where things feel so uncertain, where the future seems bleak, Mister Miracle shows us a hero who suffers greatly and manages to stand up again and again. With the power and message that was quintessentially Jack Kirby, he does what we all hope we can ever accomplish: imagine a better way forward. Mister Miracle is out in stores now!